The Junior Olympic Archery Development Program, often shortened to JOAD, is a well-established program of USA Archery that seeks to bring young people into the sport of target archery and prepare them for excellence in competition. 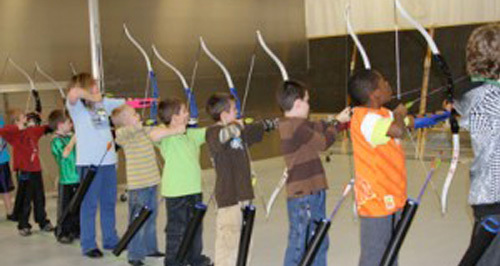 Many of America’s top archers began in this program, which is open to any youth from ages 8 to 20. The JOAD program features an introductory class taught by a certified instructor, as well as scoring games, form improvement exercises, and an award system that will help recurve and compound archers learn as they grow. Archers begin with the fundamentals and move into the advanced concepts of proper technique. Although many JOAD archers stay with the program recreationally, the program encourages archers to compete in local and regional tournaments. Those who do well enough can earn a place on a youth world team, with recurve archers given the chance to try out for the US Olympic Archery Team. Along the path to success, archers receive awards in the form of pins that represent challenges overcome by the archer. USA Archery has some grants available to qualified JOAD clubs, but many must ask for fees on a weekly basis to cover ongoing club costs like renting space, and these can vary depending on the needs of the club. Parents can ask instructors about discounts for paying in advance, but each club is different. Also, when a JOAD hosts a small tournament they usually ask for a small entrance fee that may provide for t-shirts or medals for the winners. Also, although the program supplies the necessary equipment for learning the fundamentals of archery, and will often provide rentals for use away from the club, archers typically invest in their own equipment when they reach more advanced levels. Funding for JOAD programs can be requested through USA Archery and is made possible through a grant from the Ann Hoyt Legacy Fund and the Easton Sports Development Foundation. For more information on JOAD club membership, insurance information, or to find a club click here.